This vacuum seems to be made well and is of good quality, and the color is as shown. Matches the listing. +++ Very happy with my purchase. Shipped out quickly. 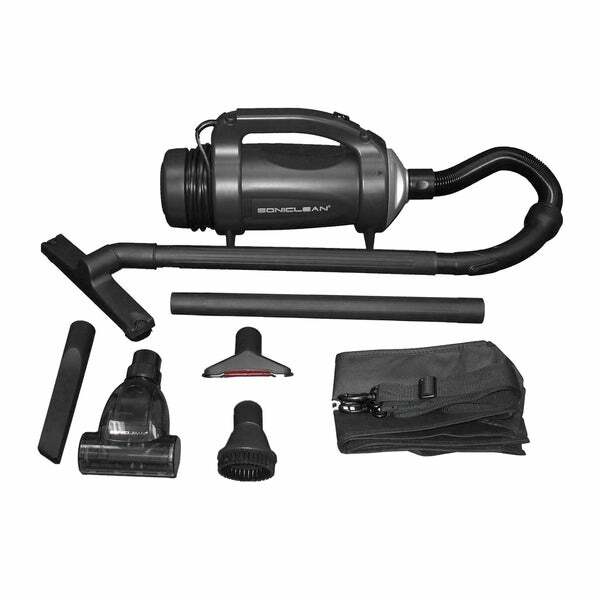 Get all the power of Soniclean in a convenient handheld vacuum. A variety of accessories help you clean all around the house, including drapes, upholstery, stairs, tight spaces and even your car. Lightweight yet powerful, the Soniclean Handheld is ideal for quick pick-ups, dry spills and more. A fantastic option for pet owners and allergy sufferers, this vacuum's included hypo-allergenic HEPA disposable bag makes it ideal for removing allergens, dust and pet dander from any surface. The 4-foot hose also allows you to deftly get at hard-to-reach spaces that may harbor irritants. The cord reaches a comfortable 15 feet to prevent awkward tugging. I love this little vacuum. Finally, a handheld vacuum that actually does what it says! It is very powerful and I end up vaccuuming half my house with it because it does such a great job of getting behind and under stuff that a regular vacuum can't get to. It comes with lots of attachments- perfect for getting dog hair out of cushions or getting deep into a seat seam. I paid twice the price a year ago from another website, and liked it so much that I bought one from Overstock for my mother in law. its fairly light and handy to use vs. lugging a large vacuum. I really only use it for curtains but the other parts can come in handy if you need them. I love this vac. It's small but mighty! "Do you offer the bags for this Soniclean handheld vacuum?" Hello TheatreRJ, no, it does not. Thank you for shopping with us! "no, it does not" is not a proper response to my question. I asked "Do you offer the bags for this Soniclean handheld vacuum?"